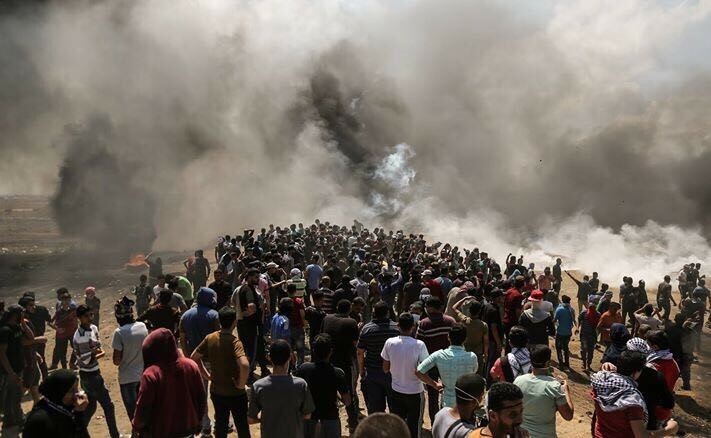 Today’s protests along Israel’s perimeter fence with Gaza have resulted in the highest number of both fatalities and injuries since the ‘Great March of Return’ began on 30 March. As of 20:30, 55 Palestinians were reported killed by Israeli forces, including six children (one female), according to the Ministry of Health (MoH) in Gaza. Among the fatalities was one health worker, in addition to others killed by Israeli shells in unclear circumstances. Some 2,771 people were reported injured, including 1,359 by live ammunition, with 130 people in a critical condition, according to the MoH. The UN Secretary General, Antonio Guterres, has expressed his profound alarm at the “sharp escalation of violence” and the “high number of Palestinians killed and injured in the Gaza protests”. The protests today coincide with the official transfer of the U.S. Embassy from Tel Aviv to Jerusalem; tomorrow’s protest will mark the 70th anniversary of what Palestinians refer to as the 1948 ‘Nakba’. These are expected to be the culmination of a series of mass protests which have taken place on successive Fridays since 30 March. In anticipation, the Israeli authorities have deployed additional troops and dropped leaflets from the air throughout Gaza, warning Palestinians not to approach or damage the fence. The Gaza Strip observed a general strike today with all public institutions, including schools, banks and commercial shops closed. The number of participants in today’s demonstrations was estimated by local sources to be around 35,000, much higher than in previous weeks, with protestors gathering at approximately 15 concentration points located several hundred metres from the perimeter fence. Hundreds of Palestinian demonstrators marched from the gathering points towards the perimeter fence, where they burned tires and threw rocks at Israeli forces, and flew kites with flaming materials attached to them into Israeli territory. Israeli forces responded by firing rubber bullets and tear gas canisters, and by firing live ammunition, including by snipers. Since 30 March, 97 Palestinians, including twelve children, have been killed by Israeli forces during the course of the demonstrations. In addition, 13 Palestinians have been killed during the same period in other circumstances, including six who were shot at the fence or after crossing into Israel, and whose bodies are reportedly being withheld by the Israeli authorities. The cumulative number of injuries has exceeded 12,271, of whom 6,760 have been hospitalized, including 3,598 (53 per cent) by live ammunition. Today, an Israeli soldier was lightly wounded and was taken to hospital for treatment, the first Israeli casualty reported to date. The large number of casualties among demonstrators, in particular the high percentage injured by live ammunition, has raised concerns about excessive use of force, alongside calls for independent and transparent investigations of these incidents, including by the UN Secretary-General. Israel has also stated that a fact-finding mechanism will review the use of force, including incidents of fatal shooting. The Israeli authorities have stated that many of the fatalities in previous protests were members of Hamas and other armed groups. The Israeli authorities also reported today that they responded to attempts to breach the fence and shots fired at them from Gaza, and that three of those killed today were trying to plant explosives along the fence in Rafah. In addition, reportedly, 35 fires were caused on the Israeli side, allegedly due to flammables-carrying kites from Gaza. Kerem Shalom, Gaza’s main crossing for the entry and exit of goods, is closed indefinitely following extensive damage to the Gaza side of the crossing by Palestinians on 11 May. However, Israeli authorities have indicated that the crossing will be opened for “select humanitarian needs” on a case-by-case basis and allowed seven trucks to enter Gaza yesterday, at least six of which were carrying medical supplies. Humanitarian agencies have warned that a prolonged closure would exacerbate the already dire situation of services and livelihoods in Gaza. No goods entered Gaza today through either the Kerem Shalom or Erez crossings today. Israeli and Palestinian sources are reporting that the Kerem Shalom crossing suffered further damage today, with Palestinian protestors entering the site for the third time in 10 days. The Rafah passenger crossing between Gaza and Egypt is exceptionally open in both directions for six days this week, the longest such opening recorded since 2014. The Egyptian authorities allowed the entry of 102 truckloads of goods, including 80 carrying construction materials, through the Salahedin gate, west of the Rafah Crossing, on Saturday. Additional Israeli forces were also deployed in the West Bank, including East Jerusalem, in anticipation of protests against the US embassy relocation and the Nakba commemorations. Today, some hundreds of Palestinians protested in Ramallah, Nablus, Hebron and other localities, with a number of relatively limited clashes reported at various checkpoints. Initial figures indicate that 33 Palestinians were injured in the context of these clashes at Qalandiya checkpoint. Humanitarian actors have identified three areas of intervention to respond to the urgent needs arising from the ongoing protests in Gaza: providing immediate life-saving healthcare; monitoring, verifying and documenting possible protection violations; and scaling up the provision of mental health and psychological support for people injured or otherwise affected. Some US$ 5.3 million has been requested to respond to needs emerging until 31 May 2018. So far, $2.2 million have been provided by the oPt Humanitarian Fund, while the UN Central Emergency Relief Fund (CERF) allocated $1.26 million last week. The health response is the main priority, given the enormous rise in casualties and the poor conditions of the health system in Gaza. In anticipation of the intensified clashes in Gaza today, the MoH and the Palestine Red Crescent Society enhanced their Advanced Medical Points with medical teams and extra beds and resources. With support from the International Committee of the Red Cross (ICRC), triage tents of 30-40 beds were established at seven MoH hospitals to cope with the expected influx of wounded people. The MoH has requested Egypt to provide Gaza hospitals with drugs and emergency medical disposables, and to dispatch medical teams specialized in vascular surgery, orthopaedics, anaesthesia and intensive care. The MoH has also requested to transfer patients to specialist hospitals inside Egypt because of the increasing numbers of patients who had complex surgeries which require therapeutic interventions unavailable in Gaza. Since the start of the demonstrations on 30 March, the World Health Organization (WHO) has documented a growing number of attacks on health facilities and health personnel. 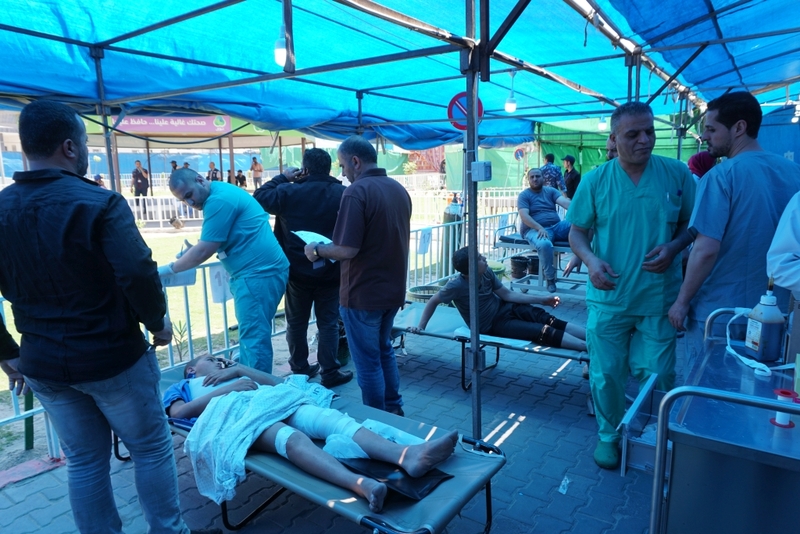 As of 13 May, there were 211 recorded attacks against health workers attending the large numbers of injured during mass demonstrations at the border fence. Nine sustained bullet wounds, 13 were injured by tear gas canisters and 189 suffered with tear gas inhalation. Twenty-five ambulances were also damaged. Following the death of a health worker today, WHO reiterated its calls for the protection of all health workers and health facilities. Meet Manar Arafat, a 30-years-old #Palestinian woman from #Gaza, and her family. Here, they are... 7 hours 43 min ago.